For all incidents that require an immediate response by the police, you should call 911. Although this response is qualitative in nature, the best suggestion is to call 911 when you know that someone is injured, someone may be injured or loss or damage to property may be imminent without quick police response. If you find yourself questioning as to whether you should call 911 or the business line, 508-763-5112, call 911. The dispatcher will evaluate the urgency of the call and courteously instruct you what to do. What hours is the Rochester Police Department open? Your police department is open 7 days a week, 24 hours a day, 365 days of the year. We are prepared to respond to the needs and answer any questions, anytime of the day or night. What do I do if I enter the lobby of the police station and no one is there? There is a station clerk in the old dispatch center Monday through Friday 8 am to 4 pm. To the left of the dispatch window there is a direct dial phone with instructions above it. 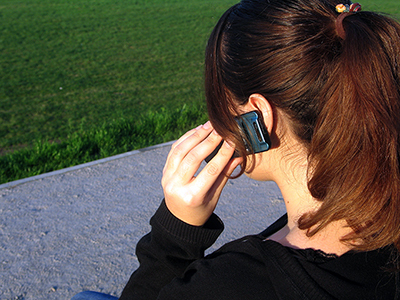 Pick up the handset on the phone and wait for a dispatcher to answer. The phone rings directly to the ROCCC dispatch center. What do I do if I enter the police station because I am in danger and nobody is there? There is a station clerk in the old dispatch center Monday through Friday 8 am to 4 pm. If you come in during any other hours and have an emergency where you need to feel safe, you can lock down the police station lobby. 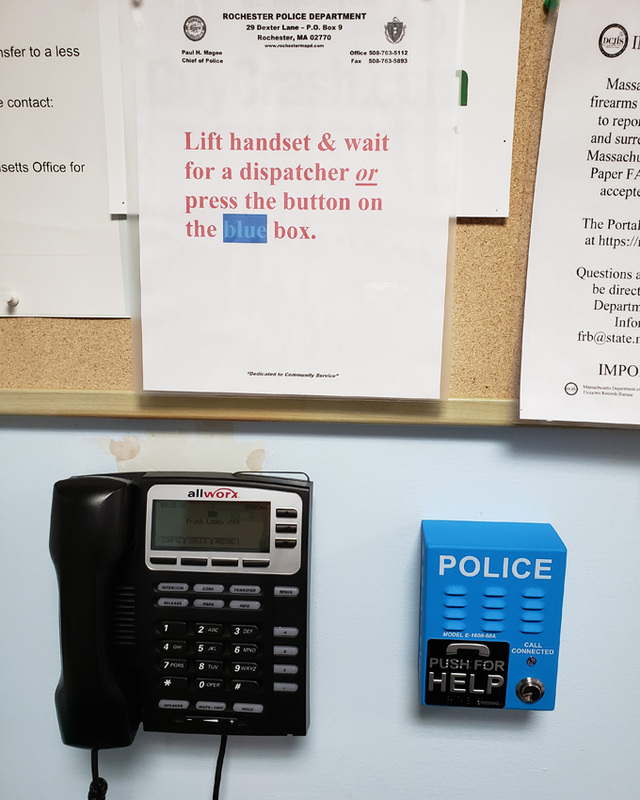 There is an emergency button on the wall to the right of the dispatch window. Pressing that button will lockdown the police station and prevent anyone from entering or exiting the lobby until the door is manually released. Are community groups such as the Boy Scouts, Girl Scouts, school groups or other youth organizations allowed to tour the Rochester Police Department? We welcome all groups but recommend that you contact the Chief's Office at 508-763-5112, Extension 112, for further details and to set up an appointment. Who should I call if I am aware of an immediate traffic hazard? Call 911 if you feel that someone is injured or about to be injured or property damage is imminent without immediate police response. Otherwise, call the business line at 508-763-5112. A police officer will respond immediately to remedy the hazard. If this is a problem that can be rectified with proper signage, our Safety Officer will be contacted to further evaluate the situation. What should I do if I think that there is a rabid animal (raccoon, skunk, etc.) in my neighborhood? Keep all people and pets away from the suspicious animal. Call the Rochester Police Department at 508-763-5112 for assistance. What can I do about an animal problem such a raccoon in a chimney? This is a function that the police officers are not trained to handle nor do they have the proper equipment. If you call, a police officer will respond to your residence to ensure that you and your family are safe from injury. We will recommend that you call one of the commercial Animal Wildlife Removal Services generally listed in the Yellow Pages of your telephone directory. How do I register a complaint concerning my neighbor's dog? Just call us at 508-763-5112 to reach the Animal Control Officer, who is responsible for assisting residents with complaints concerning dogs. Do I need to report to the police if I've been involved in a motor vehicle accident? If you are involved in any type of motor vehicle accident (no matter how minor) you must stop and identify yourself to the other driver(s) or property owner(s) involved. If the damage to the other vehicle(s) or property exceeds $1000.00, or if someone is injured (no matter how minor), or if one of the vehicles involved has fled the scene then you must report the accident. Under Massachusetts General Laws Chapter 90, section 26, you have five business days to file an accident report. Your license can be suspended or revoked if you fail to submit an accident report within this time period. What should I do if I've been involved in an accident and I need to report it? Safety should be your first priority. If you can do so safely, move your vehicle to a safe location, such as the side of the road. Try not to alter the appearance of the accident scene or alter any damage to your vehicle. Once the police officer arrives on the scene, you will be asked for your driver's license and registration as well as a series of questions regarding the cause of your accident. Do not try to assess blame or make accusations regarding other drivers or people involved. Just state the facts, and the police officer or your insurance company will make the final determination of fault. You must also complete a Commonwealth of Massachusetts Operators Accident Report. You can obtain a copy of this form at any police department in Massachusetts, at any branch of the Massachusetts Registry of Motor Vehicles or online at the Registry's website. Can a police officer fill out the accident form for me? No. Police officers, including officers of the Rochester Police Department, are not allowed to assist a motorist with completing an accident form. However, your insurance company and its staff may be able to provide you with some assistance in completing your report. In an effort to provide citizens and insurance companies with the ability to obtain accurate and affordable crash reports as quickly as possible, our crash reports are now available for purchase online. All online requests for crash reports can be made at BuyCrash.com. BuyCrash.comcharges a nominal convenience fee for this service which is added to the cost of the report. Involved parties that do not wish to pay the convenience fee can still come to the police station and pay only the cost of the report. For those that choose to purchase copies of crash reports online, simply go to BuyCrash.com and click on the state for where the accident happened. To obtain a copy of a police report, you will need to stop by our department and complete a request form. There is a $5.00 fee for copies of police accident and incident reports. Charges for other reports are assessed at $1.00 per page. Under the law, our department has ten business days to furnish a copy of a police report to you, although we generally do so faster. Do you provide letters of good conduct? Yes. Submit a letter of request to Chief Paul H. Magee requesting a letter of good conduct. A record check will be performed and a letter will be provided. Please include your full name, date of birth, address, and your social security number. Does the Rochester Police Department fingerprint town residents for background checks or employment purposes? If so, what is the cost? Yes. We provide this service to all town residents free of charge. Please the station at 508-763-5112, Extension 0, to arrange for a time to have your fingerprints taken. If I am stopped by the police for speeding, what should I do? Stop your vehicle as far out of the lane of traffic as possible. Stay in your vehicle and turn on your interior light. Good lighting assists good communication. Relax and remain in your vehicle. If you leave the vehicle, you subject yourself and the officer to danger. Keep your hands in view at all times, preferable on the steering wheel. Wait for the officer to request your license and registration. Police officers are trained to ask for your identification first, and provide an explanation for the stop second. Then, give the officer a chance to explain. Providing your documents will speed the process. Remember, in most cases, the officer is in uniform, displaying a badge and name tag. You have the advantage of knowing with whom you are dealing. Extend the courtesy by presenting the requested paperwork without an argument. It makes sense and it's the law. If the officer writes you a citation, do not argue. If you think that the citation was wrongly issued, the proper procedure is to request a hearing through district court. Read the back of the citation for further instructions. Who has to wear a seat belt? Under MGL. Chapter 90 Section 13A, the operator and all passengers are required to wear seat belts. Failure to comply will result in a $25.00 fine. If the operator is unbelted, they will receive the citation. If a passenger is at least 12 years old but not yet 16, then the operator will be cited as they are responsible for all younger passengers. If an unbelted passenger is 16 years of age or older, then the passenger will be cited directly. Under this section, the officer cannot stop a vehicle based on the fact that an operator or passengers are not wearing a seat belt. There must be a separate reason for the initial stop. Children, who are under 5 years old but weigh more than 40 lbs., must ride in a booster seat. Children who are 5 years old or older, and who weigh more than 40 lbs., must ride with a seat belt. However, it is highly recommended that they use a booster seat. Under this section an officer may stop a vehicle whose passengers may be in violation of this law. This is a primary stop and the officer needs no other reason for the stop. What can I do about a speeding problem on my street or in my neighborhood? Call us at 508-763-5112 and inform our dispatcher of your observations and the general times of the infractions. We will dispatch a cruiser to the area to assess the situation and possibly run radar. Also, we have a speed monitor trailer that we may decide to set up in your neighborhood to assist in better educating drivers concerning the speed limit. Although officers routinely patrol side streets, it is you, the resident who is most aware of changing traffic patterns in your neighborhood. We rely on you to bring your concerns to our attention in order to help drivers better obey traffic laws. Can the police provide assistance to open my car if I have locked the keys inside? Yes. This is just one of the many unique services that your police department still provides, although we are limited in attempts to unlock certain newer vehicles. Please call us if you find yourself in this dilemma. Can the police provide assistance if I have locked myself out of my house? Yes. We will respond to your home and attempt to gain entry in the least obtrusive manner possible. If we find that the equipment that we have will not be of any benefit, we will work with you to attempt to find suitable assistance. Yes! The Police Department depends upon town residents to call in reports of crimes or suspicious activity. You will be asked questions about the activity to determine its nature and ask for details. What should I do when I'm going on vacation? Contact the Rochester Police Department at 508-763-5112 to inform us of your vacation plans. Although we cannot guarantee regular checks of your property, filing contact information with us will help if a problem arises at your property during your absence. Don't leave large amounts of cash or jewelry in your home. Consider use of a safe deposit box. - Consider using a trusted friend or a relative as a house sitter while you're away. Make arrangements for pickup of newspaper and mail (consider stop delivery). Have your lawn mowed on a regular schedule. Consider having a close neighbor park their car in your driveway and to be alert for any suspicious activity. Don't publicize your trip until after your return. I return home and find my front door open. Should I go in? NO. Go to a neighbor's house and call the police. If you return home and notice anything suspicious such as a broken window or an alarm sounding, DON'T GO IN. You want to avoid any interaction with an intruder. How do I avoid becoming a victim of a scam or identity theft? Never give anyone your personal information, especially if you do not know who they are. That includes providing or confirming your address, bank account, credit card numbers, phone numbers or date of birth. Do not write account numbers on the outside of payment envelopes. Destroy any records, canceled checks, receipts, deposit slips, etc. before throwing them away. If you have a shredder, use it. If not, tear the bills, receipts, etc. into tiny pieces and try to put them in different trash cans. Anytime you are asked to pay money to get a "free" gift you should refuse to pay the money. It is likely that the offer is fraudulent and even if you were to receive the gift it would be a cheap imitation item. Guard your Social Security number. Do not have it imprinted on checks. If it is requested by a business, ask if there is an alternate ID that can be used. If not, ask for an explanation why the number is needed. It should not be used for identification purposes. Check with the National Fraud Information Center on 1-800-876-7060. The NFIC provides lots of valuable resources about telephone, mail and online scams. Always use common sense. If you have a gut feeling that something is not legitimate, you are probably right. What should I do if I suspect that I am a victim of an identity theft? You should first contact your local police and make a report. You can then use that police report to request that the consumer credit reporting agencies block any information that you contend appears on your credit report as a result of an identity theft. Check out the Federal Trade Commission's web site for more information on identity theft. I would like to obtain a shoulder patch from the Rochester Police Department. Do you sell patches? No, Rochester Police Department patches are no longer available due to public safety and security concerns. I need to see the police chief about something. When is he in the station? Chief Magee is generally available between 8:00 AM and 4:00 PM Monday through Friday, but you should telephone his office at 508-763-5112, Extension 112 to make an appointment. This will ensure that you are provided with the time necessary to adequately discuss your concerns with him. I need to obtain or renew my FID card or pistol permit (LTC). What do I need and where do I go? If you are a Rochester resident, you must obtain or renew your FID card or pistol permit through the Rochester Police Department. Simply visit the station to fill out the new application or renewal form. There have been many changes in the firearms laws recently. To read about all the changes, as well as to find out what you need to bring with you for your firearms permit, please visit our Firearms Permit section on this website. The police chief issued me an FID card many years ago so I could carry mace or go hunting with my rifle. At the time I was told my FID would be good for life. Is this still true? No. If your current FID card does not have a fingerprint or photo of you on it, then it is expired. New changes to the firearms laws require all FID cardholders to renew their cards. There is no grace period on expired FID cards. Expired cardholders caught carrying a weapon can be subject to a fine up to $5000 and/or arrest. Please see the Firearms Permit section of this website for more information. Can I purchase an official Rochester Police Department patch? The Rochester Police Department DOES NOT honor requests to trade, sell, or donate Rochester Police Patches to any person(s) or group. This position is necessary for public safety reasons. All requests will be discarded.